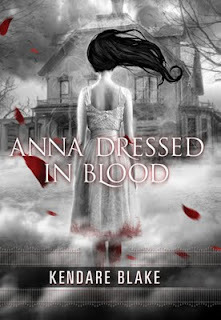 Lisa D. Writes: Hanging out with Kendare Blake and giving away a copy of Anna Dressed in Blood! Hanging out with Kendare Blake and giving away a copy of Anna Dressed in Blood! I have a book in my hot little hands. Yes, I do. And, if you're lucky, even though this book doesn't release until August 30th, it could be in your hot little hands very soon, because I'm giving an ARC away RIGHT NOW! You seriously want this one. Seriously. and it's by my editor sister, Kendare Blake. This book is just bunches of WOW and OMG! You won't be able to put it down! Promise! I know! We got so lucky. Mel is always on the perfect wavelength editiorially. Her instinct on what to cut, what to soften, what to emphasize or blend is so spot on that whenever I read her notes it feels like I thought of it myself. A definite "Oh yeah. Of course" moment. Now if only she'd stop being such a slave-driver in my nightmares. Have you had those? Apparently me and at least one of her other authors have horrible Mel nightmares, in which she changes our covers and laughs maniacally, or forces us to write in German. So, yeah...no. I've never had Mel nightmares. Now I sorta feel left out. All right then... Moving right along. What made you want to write from a (totally cool) male POV? The book I'd just come off of had one male POV, and it was a lot of fun. Cas was the natural narrator, and it wasn't really that much of an adjustment, which I think stems from my 12 year bout of Tomboy-ism. Tell the truth. Cas is your husband, right? Cuz I met him and he’s pretty cool too. I may or may not tell him you said that. He gets so conceited! But truth...Cas isn't my husband. The only thing they really have in common is a ridiculous urge to climb rocks that are not safe for climbing. And an inherent fear of sushi. Cas is just...Cas. I have no idea where he came from, and I thought not a lick about his character before I wrote him. He just was. If I was to try and hang out with Anna, what do you think she’d go after first? Maybe rip my still beating heart out? Or just tear off my head? Hmm. Well, she really loves dismemberment. So maybe you'd just lose a limb? Hopefully not the arms because you need those for writing! The ghosts. Ah yes. Little bit of backstory...one of my best friends is obsessed with serial killers. She wrote her graduate thesis on Bundy and Dahmer. So I've heard a lot of nasty tales over the years. Police accounts of victims, that sort of thing. It's really terrible. Makes you want to live in a bubble. So when I wrote ANNA, and I needed horrible things...I just had to dig around in the back of my many, many repressed memories. And, last but not least, I love the Wiccan theme of Anna Dressed in Blood. Fess up. You’re a witch, aren’t you? Crap! The jig is up! Time to throw the cauldron in the back of the Volkswagen van and get out of here. But seriously, I enjoyed the Wiccan theme also. I've been familiar with the religion for most of my life, and though the Wiccan world in ANNA is fictionalized, I wanted it to stay grounded in reality. Thanks for clearing that up, Kendare! So, y'all want a copy, don't you? All you have to do to enter for an ARC of Anna Dressed in Blood is leave a comment below before noon on Friday (8/5/11). And, just because I love you, I'll throw in a signed copy of Original Sin. You can earn an additional entry for Tweeting or Facebooking the contest. Must be 13 to enter. Open internationally. Ohmigosh I've heard so much about this book and seen it everywhere! I would love to win a copy! Thanks, Lisa and Kendare! Thanks for giveaway!! It's simply amazing! Yay! I really want to read this one. Thanks for the wonderful post! I really, really want to read this book! I've heard such good things about it! Thanks so much for the giveaway! I don't know which I want to read more, ANNA or Original Sin. I'd gladly settle for both in my hot little hands... That was wishful thinking. woot! Thanks for the chance, this book looks AWESOME! Thanks!! I want to win this book SO bad! Wow. That does sound like an awesome book. Thanks for the shot. It sounds like an awesome book! Thanks for the opportunity! What sort of obstacles did you face writing from a male pov? Are there any songs that could describe the atmosphere, actions and feel of ANIB? Do you have a playlist? I think it's great we get to read from a male POV. We don't get too many of books like that. I would love to read Anna Dressed in Blood. I've heard good things about it. Would be awesome to win. Thanks for the giveaway! Thanks for the awesome giveaway! I am dying to read this book I've heard so many great things about it. I've heard a lot about this book,can't wait to read it!Thanks for the giveaway! me me!! OMG! !I've been dying to read that book!! and I looooooved this interview she seems so fun!!!!!! now I'm intrigued with the whole idea of the book!!! thanks for this! I've read Original Sin and loved it. Anna Dressed in Blood is on my TBR list and I've been checking the libraries to see if they bought a copy yet. Awesome! I've been looking forward to this one for a while. This book sounds so awesome. I've been wanting it for a while. Thanks for the giveaway, Lisa, and a fantastic interview! I have been waiting for this book forever!! I cannot wait to read Kendare's book!! I've been looking forward to it all year. Love the spooky sounding story. awesome! I really want to read Anna Dressed in Blood!! sounds soooo creepy....i need my hands on a copy!!!!! great giveaway!!! Oooh, this has been on my to-read list for ages! I am so anxious to read it! Thanks for the chance! Would so love to win this book! I've heard so many great things about this book. I LOVE the cover. Thanks a bunch for hosting this giveaway. Awesome! This book seems just my type. Wow!!! This is awesome!! Nice questions. Thanks for the giveaway. awesome giveaway, I've been waiting for both of these books for far too long! Oh my gosh, I have been so excited to read this book. I've heard such good things about this book! Wow, thanks for all the kind compliments on the cover art and such. It is definitely cool to have Lisa as an editor sister! We're going to be signing together sometime this fall (so help me! We will!) and I can't wait to see her again. Questions to answer: No playlist. If Anna had a song, it might be the Fiona Apple cover of Sally's Song from The Nightmare Before Christmas. But just in tone. Obstacles to Male POV: Well, dudes don't tend to EMOTE that much. So the touchy feely bits were...tough. I would love, love, love to win a copy of either book! Thank you for a great giveaway!! Awesome giveaway, can't wait for anna dressed in blood! This sounds like a really good book. I LOVE the cover. Thanks for the interview & the giveaway! Loved the interview, and I cannot wait for this book to be released! I can't wait to get my hands on this book so getting it early would be awesome! And the cover is so pretty! I have seen rather a lot of hype on the blogs around about this book and to be honest that type of thing can sometimes turn me off a book but I am still curious about this one, so please enter me in the giveaway. Thanks for the great giveaway! I love the cover. Ahh I really wanted to read Anna Dressed in Blood. I can't wait to read this book! Great interview and thanks for the giveaway! My name is Anna so, clearly, the pinch of weird in me absolutely can't wait to read a book where a character who shares my name is a killer ghost. Okay, maybe it's a lot more than a pinch. That being said, I'm really excited to read this book and would love to get a ARC - plus, I loved Personal Demons and haven't yet read Original Sin. how fun - a book giveaway for books i really want!! thanks for hosting such a fabulous giveaway. I'm soooo excited for this book!!!! Please enter me. I'd love this! What a fun interview! I think there need to be mre witch/Wiccan books in YA. It's such a fascinating topic, and there's so much there to explore! I didn't realize there was a Wiccan aspect to this novel, but now I'm even more excited to read it! Thanks so much for the great interview and giveaway, Lisa! I'd love to read this, it looks really interesting. Thanks for making it international!! Sounds exciting. Sign me up! OMG! I've been dying to read Anna Dressed in Blood! Thanks so much for this giveaway! The interview was awesome! Everyone says that this book is da BOMB! Hope I win! I've heard great things about this book! I'd love to win a copy! Really wanting to read both books. Great giveaway and that is an awesome cover, thanks. I would love to win Anna Dressed in Blood! The cover art is beautiful &the cannot wait to read it after all the awesome reviews I've read on it. If I don't win the ARC (hopefully. I do) then its def on my to buy list. Thanks for the chance at something awesome like this!